The Milky Way sets over the Cosmic Campground, New Mexico, with the lights of Morenci, Arizona, on the horizon in the distance. Photo by David Thornburg. IDA is pleased to announce the designation of the Cosmic Campground as an International Dark Sky Sanctuary. It is the first such designation in the U.S., and the first IDA International Dark Sky Place designation of a U.S. Forest Service location. “We are very excited to announce the inaugural designation of an IDA Dark Sky Place on Forest Service land, and hope to strengthen our ties with this important public land management agency,” said IDA Executive Director J. Scott Feierabend. International Dark Sky Sanctuaries are public or private lands possessing an exceptional or distinguished quality of starry nights. Their dark nighttime conditions are specifically protected for their scientific, natural, educational or cultural value, and are often located in some of the most remote and undeveloped parts of the world. Sanctuary designations are made by IDA to increase awareness of these fragile sites and promote their long-term conservation. The new International Dark Sky Sanctuary is a 3.5 acre (1.42 hectare) site in the Gila National Forest of western New Mexico, U.S. 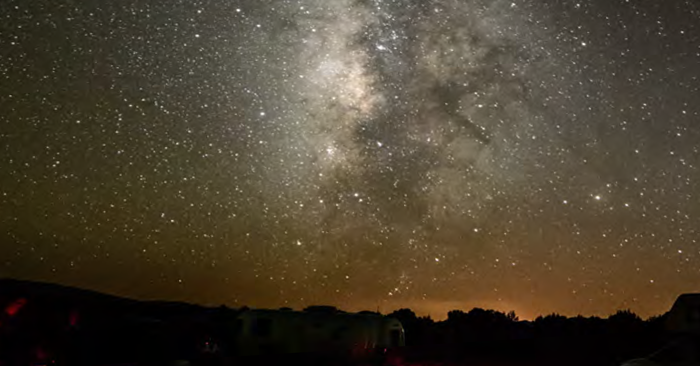 Located between the Gila Wilderness and the Blue Range Primitive Area, the Cosmic Campground is situated in an exceptionally dark part of the lower 48 U.S. states. It features a basic infrastructure to support campers and offers a 360-degree, unobstructed view night sky. The nearest significant source of electric light to the site is more than 40 miles (65 km) away and across the border of neighboring Arizona. Coupled with ready accessibility by road and typically clear, dry weather conditions at moderate altitude, the Campground could become a new mecca for amateur astronomers and casual stargazers seeking a one-of-a-kind experience under the stars. There is no permanent, artificial lighting installed at the Cosmic Campground, and the Forest Service’s plans do not call for any such lighting in the future. Rather, the Campground is to be maintained in a state that allows visitors to experience nighttime conditions close to those before the introduction of electric lighting in the late nineteenth century. At the same time, visitors can access modern conveniences, such as wi-fi network connectivity via a cell tower located 15 miles to the south of the Cosmic Campground. Officials see the potential for the Cosmic Campground’s new IDA status to yield a positive economic benefit for western New Mexico. Tourists who come for the extremely remote character of the nearby Gila Wilderness may well find that the Campground extends the sense of the area’s primitive quality past sunset. Preservation and protection of this International Dark Sky Sanctuary will provide a place to gaze in wonder at the vast expanse of a natural night sky. People from around the world will discover how truly accessible its natural night sky is to visitors from everywhere. Children will discover their night vision allows them to “see” in the dark. Astronomers will come to experience and, possibly, photograph the incredible night sky. Families will visit the Cosmic Campground International Dark Sky Sanctuary and explore the trails, rivers, and mountains of the Gila National Forest as well. The area economy will benefit from the “take only photos/leave only footprints” of these visitors. Visitors will share memories and bring others to see for themselves.